Agarose LE is a highly purified agarose, suitable for a variety of molecular biology applications. It is refined using an advanced process that excludes the use of organic solvents, yielding a cleaner end-product with a significantly reduced environmental impact. 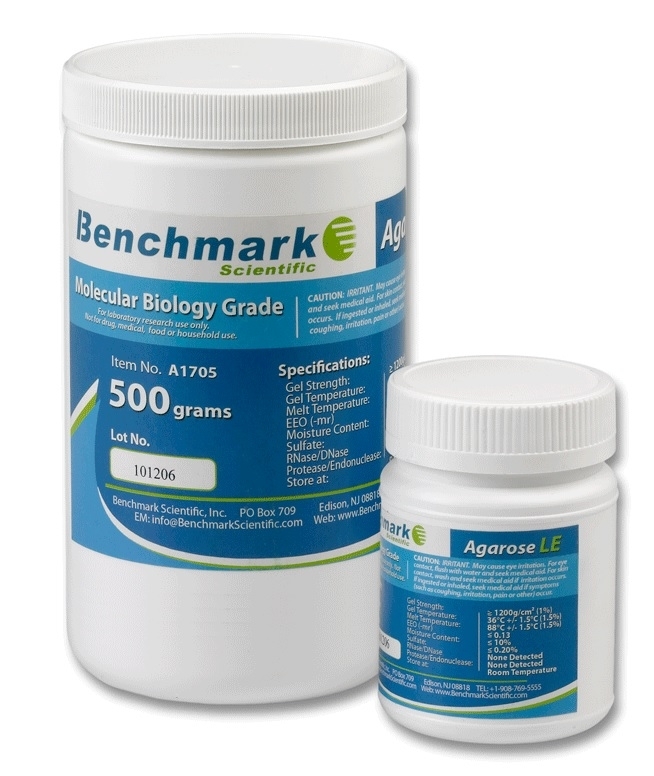 Agarose LE can be used for analyses of proteins and nucleic acids of various sizes (150 bp to 6 kbp). It's low EEO (≤ 0.13-mr ) promotes increased electrophoretic mobility, yielding improved resolution and shorter run times. This also allows macromolecules and larger particles (subcellular fragments, viruses, etc.) to migrate more freely through the gel matrix. The consistently low EEO also provides a reduction in band distortion (caused by counterflow) that can result from the presence of excessive sulfate-rich negative ions. Agarose LE is widely used for nucleic acid electrophoresis (analytical and preparative), protein electrophoresis (including radial immunodiffusion) and various blotting protocols. It is easily soluble, free of nucleases, and easy to use. It is highly transparent (forms a clear, colorless solution at 1g:100ml H2O), and exhibits exceptionally low absorption of chemical staining agents. Pore size can be adjusted by simple modifications to the concentration ratio. Formulated for high gel strength and integrity, Agarose LE exhibits exceptional thermal stability and mechanical resistance, ensuring safe, easy handling, regardless of whether a denaturing agent has been added.